One of the newest Drywall carts to come on the market is a drywall cart by McDonald Manufacturing. What is unique about this new cart is ability to be shipped in a collapse form. This saves freight cost because you are not paying for dimensional weight rates. 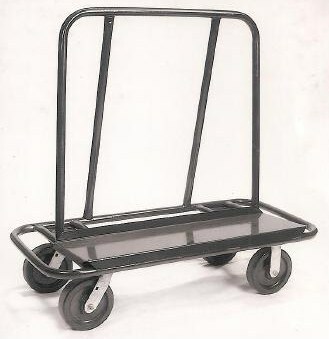 Product code is 45C and cart comes in box that is 50 inches by 8 inches by 26 inches. It still maintains its rigid constructions. Assembly required is only 4 bolts and nuts for frames and 4 casters have 4 nuts. Average assembly time is 10 minutes.